Worthy Israel Tours – See Israel in a different way, meet the people, experience the culture, and enjoy the best Israel has to offer. Shalom Friends! We are super excited to invite you to join us for our annual Real Israel Tour, as we celebrate 20 years of ministry with Worthy News! Why do you want to come with us? Well, we call it the Real Israel Tour because our focus is on the culture and the people of the Land. Since we live in Israel, we not only speak the language but we know the best places to go and how to take good care of you. We skip the tourist-trap, sales-pitch stops and replace them with cool stuff you wont get on other tours (keep reading for more info) — and we really put our whole heart and soul into all the planning and preparation! We offer a reasonable, all-inclusive price (meaning that ALL taxes, tips and fees are included in the price of the tour… no surprises)! We have one of the absolute best tour guides in all of Israel, who is a native Israeli, and a strong believer in Yeshua (Jesus)! He, and both George and Baht Rivka will walk with you, worship with you, share deep insights and offer you a family-style, well-balanced tour of culture, history, ministry, rest/relaxation and FUN! Together we will experience amazing historical and biblical sites, relax at the Dead Sea Spa, enjoy the delicious cuisine of the Middle East, join in power-packed worship and solid teaching, do some hands-on ministry with the living stones in the Land, participate in an outreach concert for Holocaust Survivors and new immigrants, get a private tour of the Knesset (Israeli Parliament), enjoy a special Yemenite meal and cooking lesson at Baht Rivka’s father’s home…. 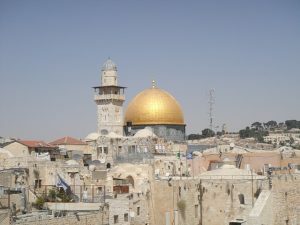 tasting at Jerusalem’s Shuk (the outdoor food market in Jerusalem), camel rides and Bedouin hospitality, lunch/worship/ministry opportunity at the Whitten’s home, an immersion (baptism) in the Jordan River, sunset boat ride on the Galilee, and loads more!! Experience the Real Israel with us as your personal hosts! This will be a LIFE ALTERING trip– the Bible will come alive as we stand in the very places these things happened… or have yet to happen! Seating is limited and only $200 holds your spot! We are standing in faith for those who need to be with us on this exciting trip and we are praying for all the finances and provisions for you to come! If you are able, please also consider bringing some things from the US in the way of cd’s, gifts and/or extra cash to bless ministries we will visit. Email us! On arrival, you will gather your luggage, go through customs and meet at Cafe Kacao (after customs, as you walk out the gate, it will be on your right, you will receive name tags in the mail to wear so that you can identify one another ). We will all go together to our luxurious bus and be off to the Negev Desert and the amazing shores of the Dead Sea (biblically called the Salt Sea, in Hebrew, Yam ha MEH-lach). We will be staying at the David Resort Spa on the beach. The indoor spa is open until about 7pm and we will have free use of the various pools, saunas and steam rooms for some Rest and Relaxation! 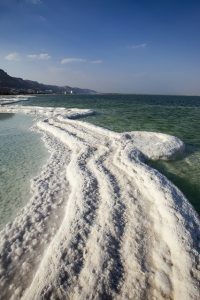 We can also go for a night swim in the Dead Sea– it is an amazing experience, weather permitting ( it is usually nice and warm in the sea that time of year)! All types of massages and treatments are available for an additional cost. If we are not able to get into the spa/treatments that evening, we have the next morning for treatments and the following night for Dead Sea Float. Dinner with the group will at 8 PM and then we will have a time of worship and orientation. This morning you can sleep in (just don’t miss the extravagant Israeli breakfast)! Or you can take a last morning swim in the Salt Sea and take advantage of the spa amenities before we trek together to the Judean Wilderness – a Bedouin tent at K’far Hanokdim. 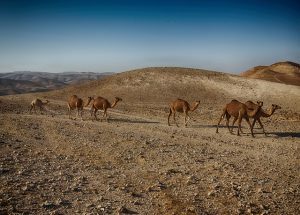 We will experience Bedouin hospitality, a light lunch and a camel ride into the Negev hills. From there, we will take a short drive to the city of Arad to a powerful site called the Fountain of Tears. We will conclude this day in God’s Promised Land at our host’s home with a wonderful time of refreshments, worship and wrapping gifts for our Holocaust Survivor Outreach Concert later in the week! Late in the evening we will go back to the hotel and get ready to travel north to the Sea of Galilee. After breakfast, we will check out of our hotel and make a few important Negev stops before we start to travel north toward the Galillee. First, Masada – The very last Jewish stronghold to fall into Roman hands, during the great Jewish revolt. Next, Ein Gedi, a breathtaking nature reserve in the middle of the desert, where David hid from King Saul (1 Sam. 24). 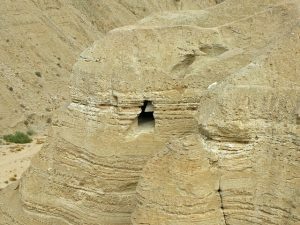 On our way to Galilee we will pass Qumran, where the Dead Sea Scrolls where discovered. We will also make a stop where John the Baptist immersed people, and where Yeshua Himself was immersed by him – Quasar El Yahud. There will be an opportunity for you to be immersed there as well! We will continue with a beautiful drive through the Jordan Valley, to the Sea of Galilee where we will stay at the Leonardo Club in Tiberias. We will be at the Leonardo Club for the duration of our stay in the Galilee region. Today, God’s Word comes alive as we literally walk in Yeshua’s footsteps as we visit the places of His ministry around the Sea of Galilee, Magdala (the city of Mary Magdalene), the Mount of Beatitudes and Capernaum. After lunch, we will meet some of the Galilee area’s Living Stones who are really making a difference in Israel and we will have the opportunity to join with some hands-on ministry there, The Beautiful Land Initiative. We will have a much-needed day of rest today. You can sleep in or have a beach day… or you can come experience fellowship at a local Israeli Messianic Congregation (Kochav Hashachar). Later in the afternoon, we will all be participating in an Outreach Concert arranged by the Whittens. 400 Holocaust Survivors and new immigrants will be bussed in from different cities for an evening of refreshments, music and gifts to honor and bless them. We will hear a few of their stories, interact with them, give hugs, prayers and gifts for the New Year (Rosh Hashana), and enjoy a concert by Baht Rivka! 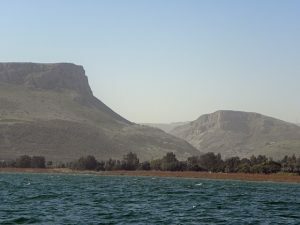 Today, we are going to explore the upper regions of Galilee and the Golan Heights. We will start our day with a visit to the ancient city of Dan, where we will study both the archaeological and symbolic aspects of this beautiful nature reserve. 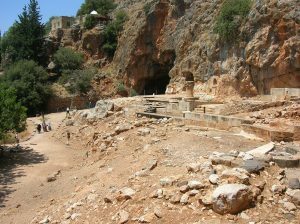 We will continue with a visit to Caesarea Philippi and Banias waterfalls where we will look at Peter’s confession (Mat’ 16:13-20) from a first-century Jewish perspective. We will continue on with a beautiful lookout point, on the Golan Heights (Mt. Bental), overlooking the Israeli Syrian Cease Fire Line, where we will discuss Saul’s (Paul) experience on the road to Damascus, as well as modern events in the life of God’s chosen people (1967 and 1973 wars with Syria). And what better way to end the day with a boat ride and worship into the sunset on the Sea of Galilee! Today, we are going to leave the Galilee region toward Jerusalem but we’ll make a few last stops. First, Cana, where Yeshua performed His first miracle (John 2), then catch a scenic view of His hometown Nazareth. Next, we are going to visit the ancient city of Megiddo (Armageddon) where we will touch briefly on important end time events and the role of God’s chosen people. Next will visit Mount Carmel, where we will discuss Elijah’s encounter with the false prophets (1 Kings 18). And last, Caesarea, the Mediterranean, where we will consider Peter’s vision (Acts 10) and the importance of this ancient city. Afterward, we will drive to Jerusalem and check in at the beautiful Olive Tree Hotel for the last three nights of our tour. We will start our day with a visit to a magnificent model of Jerusalem, depicting how it looked in Yeshua’s time. Here we will have a good introduction to Jerusalem’s history and design in the days of Yeshua. We will then visit the Shrine of the Book (Dead Sea Scrolls), which is located nearby at the Israel Museum. Next, a private tour of the Knesset (Israeli Parliament). The afternoon will be dedicated to the Jewish quarter in the Old City walls. We will experience the Cardo, beautiful Judaica shops and the Herodian Villas Museum. This visit will help us understand the Jewish mindset so we can pray for their salvation more effectively! After lunch, we will continue on to the remains of the pools of Beth Chasdah (John 5), where we will discuss the healing of the paralytic from a first-century Jewish perspective. Finally we will continue to the Western Wall (the most holy place for Jews in the Land) and then have a private tour underneath the Muslim quarter through the Rabbi’s Tunnels. We will begin the day visiting the amazing FOZ Museum, a totally unique museum experience like you’ve never had. Afterwards, we will visit the Israeli Parliament (Knesset), where we will have a detailed tour of how the Israeli government functions and where important votes concerning the Jewish state take place. Then we will then visit (and taste!) the famous Machaneh Yehuda Shuk (Jerusalem’s wonderful outdoor food market), and also enjoy a Yemenite lunch and cooking lesson at Baht’s father’s home nearby. For those who still have the energy, we will finish the day with an optional visit to Zedekiah’s Cave or a shopping excursion with Baht Rivka. Our last day in Jerusalem will start with the breathtaking view of Jerusalem from the Mount of Olives. There, we will discuss the very important and strategic role of this mountain, both in Biblical times and in the future. We will also talk about the very last week of Yeshua’s earthly ministry and follow our Savior’s footsteps down to Gethsemane, where we will ponder the unfathomable trials He endured. Our next visit will be where He was held during that Passover night – Caiafa’s house. We will conclude the Jerusalem segment of this tour at the crucifixion site – The Garden Tomb. We will then make our way to the city of Jaffa, where we will stroll its ancient streets and discuss the story of Jonah and Peter. We will end our tour with a fare well dinner by the Mediterranean Sea before we head to the airport for our flight back home. All good things must come to an end, but maybe next year in Jerusalem again! All Hotels: 4 and 5 star accommodations are based on double occupancy. An additional fee of $950 can be added if you would like your own room. We will do our very best to pair you up with another traveler but it‘s best to bring someone you know! Meals: Extravagant Israeli-style breakfast and dinner buffets daily. Tips: All gratuities, taxes and tips. Touring: All transportation by deluxe air-conditioned motor coach bus with WIFI, along with all site entrance fees and extra goodies and one of the TOP tour guides in Israel. Airfare: Everyone will purchase his/her own tickets and meet our amazing tour guide Rami Danieli at Ben Gurion Airport in Tel Aviv. Check prices from nearest airport — there are GREAT prices right now! Please follow directions very closely and make sure to pay attention to dates and times thoroughly before purchasing tickets: Your flight must arrive in Tel Aviv by 11:30 AM on Sept. 3rd. Our Bus will leave for the Dead Sea at 12:30. Your return flight must leave Israel after after 12 AM (late night) on Sept. 13th. Note: You can choose to arrive hours (or even days early) and spend some time in Tel Aviv if you like. If so, you will just have to meet our tour at Cafe Kakao on the ground floor of Ben Gurion airport with your luggage and your name tags on by 11:30 am Sept.3rd. You can also choose to stay on longer in the Land after the tour is over. We have limited space in our guest house in Arad or you can make other arrangements elsewhere. SOME BOOKING TIPS. For the BEST prices for airline tickets, book flights from either IAD (Dulles – usually 1 stop to Tel Aviv), EWR (Newark), or JFK (New York). Then find a SEPARATE flight straight to your departure destination 4-5 hours before your departure to Israel, and 4-5 hours after you arrive from Israel. Passport Application Fees: A valid passport is required to participate on this tour. All fees associated with the acquiring of a passport are your sole responsibility. PLEASE NOTE: A PASSPORT IS CONSIDERED NOT VALID IF IT EXPIRES WITHIN SIX MONTHS FROM THE TOUR DEPARTURE DATE! Trip Cancellation and Medical Insurances: Insurance to cover trip cancellations or interruptions and health insurance may be purchased from local travel agents. We highly recommend this. Lunch: Participants should budget a minimum of $10 per lunch meal daily (or just bring some snacks with you from home because you’ll be full from breakfast)! Soft drinks/alcohol are not provided with dinner but can be purchased with your meals and charged to your hotel room. Water bottles can be purchased on the bus for about a dollar each or at local vendors. Personal Expenses: Personal expenses such as laundry services, phone calls, postage, and contributions such as possible love offerings that we will take up for the various ministries and individuals we visit, as well as an additional blessing gift for our driver and guide. $200 (nonrefundable) immediately to hold your spot. It is advised to purchase your tickets sooner than later. $1000 by March 1, 2019. $1790 by May 2, 2019. Please make checks to Worthy Ministries and CLEARLY mark Worthy Israel Tours in the Memo. Please also call to let us know its in the mail at 610-624-4091 to make sure we are looking out for it. 80 days prior to departure: full refund – less $50 service fee. 60 to 79 days prior to departure: full refund – less $100 service fee. 30 to 59 days prior to departure: full refund – less $200 service fee. 1999-2019 Copyright © Worthy Israel Tours - a division of Worthy Ministries.